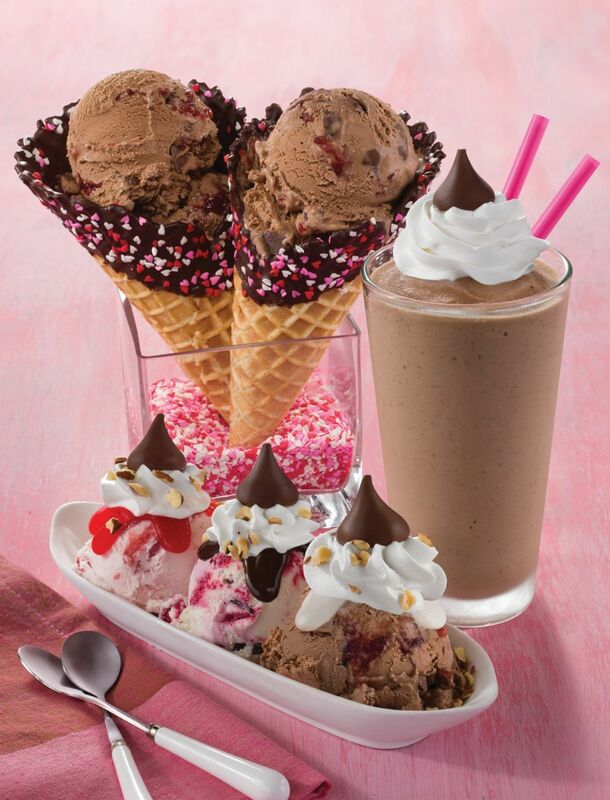 Canton, MA (Restaurant News Release) Baskin-Robbins, the world’s largest chain of specialty ice cream shops, is teaming up with HERSHEY’S to make the stuff of chocolate-infused ice cream dreams come true with the February Flavor of the Month, Cherry Cordial with KISSES. Featuring HERSHEY’S chocolate ice cream, mini HERSHEY’S KISSES, and a cherry ribbon, served in a fancy waffle cone with heart-shaped sprinkles, this brand new flavor is sure to melt any heart. Guests can also get a sweet taste of this new Flavor of the Month during a National Sampling Day on Sunday, February 10 from 3:00-7:00PM*. Baskin-Robbins is also serving up some love (and kisses) with the Love & Kisses Sundae for just $5. Two spoons are needed for this decadent Valentine’s Day treat, which features scoops of Cherry Cordial with KISSES, Love Potion 31® and Very Berry Strawberry ice creams. This ultimate sundae also includes all the fixings of an ice cream lover’s dream including: marshmallow, hot fudge and strawberry toppings; whipped cream; chopped almonds; and HERSHEY’S KISSES. Guests will be able to share their sundaes in more ways than one during their Baskin-Robbins visit by stopping at a #BRShareAKiss photo station in-store to show off how they are celebrating with friends and family on social media. HERSHEY’S KISSES Cake, a sweet pink cake topped with HERSHEY’S KISSES and red, pink and white heart-shaped sprinkles. Love Banner Cake, a white heart-shaped cake topped with your valentine’s name and a sweet love message. Pink Conversation Heart (Kiss Me) Cake, a pink, heart-shaped cake that mirrors the holiday’s recognizable conversation hearts and includes the message “Kiss Me” with red, pink and white heart-shaped sprinkles around the bottom. Whether guests are dropping by Baskin-Robbins before date night or ordering in for a cozy night at home, Baskin-Robbins is helping them spend as much time with their Valentine as possible. Through online ordering (www.baskinrobbins.com/onlineordering) and DoorDash delivery (DoorDash.com/baskinrobbins), it’s easier than ever to do it all this Valentine’s Day. *National Sampling Day on February 10th is available at participating locations nationwide. Offer valid 3pm – 7pm only.